Bacon, 1913, pp. 270, 274.
thesis for the degree of M. A. in the University of Cincinnati, 1925.
the minds of some prominent men somewhat earlier. to Lands in the State of Ohio, p. 154. Proceedings, Vol. 25, p. 65. 4 The Records of the Original Proceedings of the Ohio Company. nati, 1882, Vol. I. Int. p. XXV; Vol. I. p. CXXXVI-VII. 6 Land Laws of Ohio, p. 154; Records of the Ohio Company, Vol. I, pp. 13, 14, 31, 32, 33.
western Territory, Cincinnati, 1847, pp. 428, 433. 8 Martzolff, Land Grants, p. 66.
lands on the Ohio. The committee engaged the Rev. 9 Records of the Ohio Company, Vol. I, p. 39-40. 10 Records of the Oio Company, Vol. II, pp. 50 65, 121. 11 Records of the Ohio Company, Vol. II, p. 91.
is not that they were so few but that there were any. cated in many frontier communities. could not well be otherwise in a pioneer community. governor, and appeared in a number of other issues of the same paper. had no such laws to adopt. 13 Judge Burnet -- Notes, p. 305.
the State of Ohio. Columbus, 1876. 15 This session of the Assembly was held in Chillicothe. 17 "Laws of the General Assembly of the Northwest Territory, Vol. amount of legislation and little related to the schools. schools were more numerous than school-houses. 18 Laws of the General Assembly of the Northwest Territory, Vol. II, p. 45; Vol. III, p, 161; Land Laws of Ohio, pp. 219, 220, 221. Jacksonian Democracy, a Clay and his "War of 1812". curricula, their teachers, their buildings and their pupils. is now Tuscarawas and also in Lorain County. prominent in the settlements made in 1772 and later. pp. 607, 608. Published by C. J. Krehbiel & Co., Cincinnati, Ohio, 1904. Copyright 1888 by Henry Howe. and what he was learning there. from original manuscripts), p. 335. 23 S. P. Hildreth, Pioneer History of Ohio, p. 379.
tis, who taught two years in a cooper shop; and Dr.
25 There are several spellings for Bellepre. Belpre is also common. 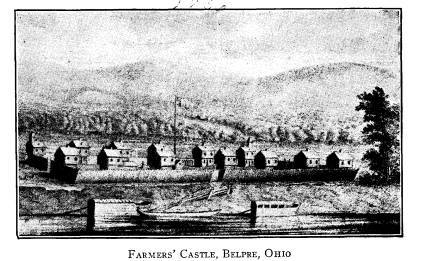 Records of The Ohio Company uses Bellepre. war of 1812 settled in Newport, Ky., where his descendants now live. Columbus, Ohio), 1905, p. 23. 27 Hildreth, Pioneer History, p. 335.
ister he served for years. 28 For details see Records of the Ohio Company Vol. I, p. 39-40.
ence to schools and to roofing a school-house earlier than this, 1788. Vol. "In the month of August boarded twelve days with Mr.
tion to tend to shift from Columbia. At any rate, Mr.
short distance west of the present location of Lebanon. This was perhaps the first school in Warren County. to swim his horse over the Miamies, it is said he never missed a court. Cincinnati, 1869. Vol. I, pp. 1, 100, 101. 32 Greve, Centennial History of Cincinnati, Vol. I, p. 181. 33 Ibid., Vol. I, p. 363.
school was taught by an Irishman by the name of Lloyd. erected in 1792, and attended by about thirty pupils. 1882, pp. 261, 477, 570.
a building at Sixth and Main kept by Thomas H.
35 Greve, Centennial History of Cincinnati, Vol. I, p. 363.
tisements in the early papers. in grounding his pupils in the practical parts of the above. in the building with the library of Cincinnati University. were secondary as well as elementary in subject matter. new country and on the Ohio. cept Saturday and Sunday, from 6 to 9 o'clock P. M.
38 The Centinel, Vol. III, No. 107, Saturday, December 5, 1795. "The Centinel of the Northwestern Territory." Files of this paper (pub. 40 Ibid. In this and other Sept. 1799, issues of the paper. 42 The Western Spy, September 24, 1800.
secondary subjects were to be given. to the regulations and management of the Academy. 44 The Western Spy, August 14, 1802, (Vol. IV, No. 159'). the issue of The Spy for January 26, 1803, Matthew G.
to themselves and an honor to their instructor.46 Mr.
45 The Western Spy. Nov. 10, 1802. (No. 15 of Vol. IV and No. 171 of series). This advertisement has the caption, "Science." be a regular Friday evening feature. for October 31, 1801, and in the three following issues. 47 The Western Spy, May 11 and 18, 1803. 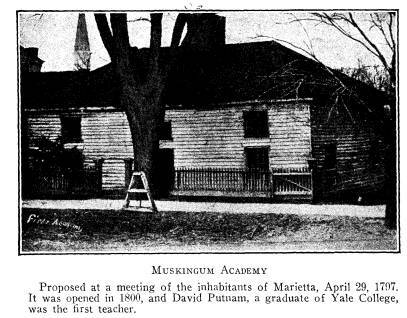 48 The Western Spy, October 31, 1801.
in and near Cincinnati that he proposes to open a school. ary 12 and 19. The school was to open on Monday, the 10th of January. 49 The Western Spy, Oct. 19, 1803. Nov. 5, 1803. Neither did the schoolmaster escape the "want-ad." 50 Ibid., July 6, 13, 20, 1803.
increased one-half mile above that of the previous advertisement. ing would hardly be approved at the present time. The generous purpose in the glowing breast. this period: "Newport Academy," "Education," "Wanted: a Schoolmaster,"
1802; Oct. 22, 1799.) The heading is no longer a part of the first sentence. 54 The Western Spy, Oct. 31, 1801.
more puritanical subscribers might have buttonholed the editor. 56 The Western Spy, July 31, 1802, issue No. 157, (No. 1 of Vol. IV). some "firsts" in this field have been assigned, by Mr.
there soon after the colony was founded in 1826. Mr.
57 Ohio Archaeological and Historical Society Publications. (Pub. P. P. Cherry--The Western Reserve and Early Ohio (Pub. by R. L.
Fouse, Firestone Park, Akron, Ohio, 1921.) p. 106.
also quoting Lockwood on "New Harmony Movement." County, West Union, 1900. Passim. 62 Chief references are the County Histories. See Bibliography. 63 Chief references are the County Histories. See Bibliography. Highland County, Madison, White Oak, and Marshall Twps. plished in this region of the state until after statehood. York, 1918, Vol. 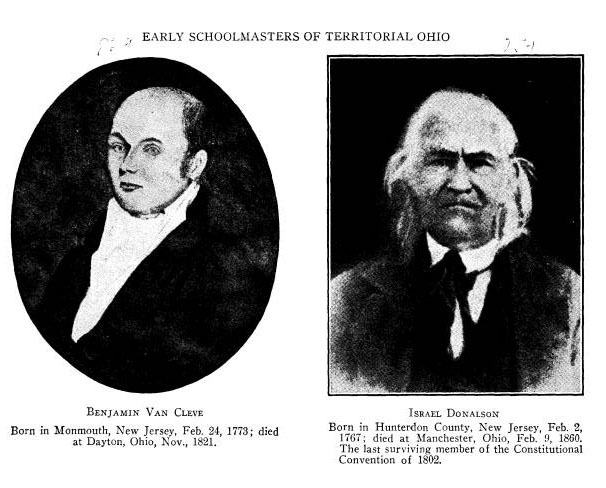 I, p. 47, p. 341; Jesse Cohen, "Early Education in Ohio"
65 Robert W. and Mary Davies Steele, Early Dayton, 1796-1896. U. B. Publishing House, Dayton, Ohio, 189,6, p. 34.
passim; C. M. Walker, History of Athens County, Ohio. 1869, p. 219.
started in 1804 where a school house had been built on South College lot. Franklin and Pickaway Counties. Williams Bros. 1880, p. 419. England, there was no disagreement about the matter. to as men of fine intellectual attainments. 68 Above, pages 6, 7.
part of the early settlers to have their children educated. the exception of Mr. Spenser's "regular English school,"
in the early influence of Pennsylvania and Southern Populations in Ohio. 72 W. H. Venable, Beginnings of Literary Culture, p. 190. 73 W. H. Venable, Beginnings of Literary Culture, p. 189.
ooze and copperas" or of some other home preparation. 74 P. P. Cherry, The Western Reserve and Early Ohio, p. 101.
of some of the most frequently mentioned early texts. 76 Kennedy, History of Cleveland, p. 114.
for his twentieth century successor. Valley pp. 192, 193; Cohen, Early Education in Ohio (Mag. of West. Hist. Vol. III, p. 221). 78 Cherry, The Western Reserve and Early Ohio, p. 101.
docket, for the call of the wild or the "old swimmin'"
may have been produced by the keen edge of a knife. 79 Venable, Beginnings of Literary Culture, p. 189, quoting Lincoln. 80 History of Ross and Highland Counties, Cleveland, 1880, p. 189.
guidance as it is recorded that the rescuer later became a doctor. 81 History of Franklin and Pickaway Counties, 1880, p. 365. Pioneer, Old Ser., Vol. III, June, 1862, pp. 21-22.
lands Pioneer, Old. Ser., Vol. 1, Nov. 1858, p. 22.
means of causing some recognition of the good St. Nick. operation of this rather famous lock-out procedure. 84 C. M. Walker, History of Athens County, Ohio, 1869, p. 219.
your signature, "I agree to the above." place, perhaps with too much of an air of assurance. to the school-house, spelled for head and were dismissed. The next day at noon a cart-load of good things arrived. 85 Jones, The Squirrel Hunters of Ohio, 1898, p. 61. 86 Jones, The Squirrel Hunters of Ohio, pp. 62, 63.
p. 221); Kennedy, History of Cleveland, p. 114.
nitely recorded instances like this seem to be very few. Vol. III, p. 220; Venable, Beginnings of Literary Culture, p. 191. 89 A History of Brown County, Ohio. Chicago, 1883, p. 1.
will the next century bring forth? the Northwestern Territory. Cincinnati, 1847. History of Franklin and Pickaway Counties, pp. 192, 361. 4. Maxwell's Code and Laws of the Northwest Territory. b. Governor and Judges, Vol. I, 1792.
c. Governor and Judges, Vol. II, 1792.
cothe. Winship & Willis, Chillicothe, 1801. Ohio. Chillicothe, Monday, Nov. 1, 1802.
west of the Ohio River. Vol. I -- First Session, 1899, Cincinnati. the Ohio River. Second Session, 1800.
ican history, Marietta College, Marietta, Ohio, 1917. Two volumes. Marietta Historical Commission. Smith. Robert Clarke & Co., Cincinnati, 1882. Vol. Among the Indians of Ohio. Translated by Eugene F.
Vol. I, pp. 388, 451, 455, 401; Vol. II, pp. 4, 292, 438.
cinnati. First issued by Jas. R. Perkins, 1847.
umes, Cincinnati, 1843, 1844. Vol. I, Vol. II. 7. Cherry, P. P. The Western Reserve and Early Ohio. zine of Western History. Illustrated. Vol. III, pp. 1878. Vol. 13 has index of Vols. 6 to 13.
cinnati, with illustrations and biographical sketches. History of Cincinnati and Representative Citizens. American Pioneer. (School in Northwest Blockhouse). Memoirs of the Early Pioneer Settlers in Ohio. H.
Assembly, Columbus, Ohio, 1876. General editors: E.
E. White and Thomas W. Harvey. a. School Legislation -- Eli T. Tappan. b. Ungraded Schools -- Alston Ellis. c. Graded Schools -- R. W. Stevenson. d. High Schools and Academies -- D. F. DeWolf. e. Higher Education -- Prof. E. B. Andrews. f. Normal Schools -- Delia A. Lathrop. g. Teachers' Institutes -- Thos. W. Harvey. h. School Supervision -- John Hancock. i. Teachers' Associations--E. E. White. cals -- W. D. Henkle. 18. Howe, Henry, L. L. D. Historical Collections of Ohio. Ohio Archceological and Historical Society Publications. Cleveland. Its settlement, rise and progress, 1796-1896. The Imperial Press, Cleveland, MDCCCXCVI, (1896). Ohio, or Glimpses of Pioneer Life. Cincinnati, Robt. 25. Mathews, Alfred. Ohio and Her Western Reserve. has index of Vols. I to XI. ern Reserve. B. A. Hinsdale (An address). b. Vol. 25, Pioneer Schools and Schoolmasters. D.
vertised in the Western Spy, referred to). f. Vol. 16, p. 203; Vol. 12, passim; Vol. 17. Cleveland, 1910. Vol. I. Historical. sions. Second edition -- Athens, 1918.
ton, 1883. P. Lee & Shepard. 31. Robison, W. Scott. History of the City of Cleveland. Its Settlement, Rise and Progress. Cleveland, 1887. Dayton, 1796-1896. U. B. Publishing House, W. J.
sources and Progress. Columbus, 1873.
the Ohio Valley. Cincinnati, Ohio, 1888. Valley Press. 37. Western Reserve Historical Society. Cleveland, Ohio. tral Ohio Sixty Years Ago -- Martin Welker. D. County Histories. Some of the County Histories Consulted. of Adams County, West Union, 1900. 5. Highland County -- See Ross County. 6. Pickaway County -- See Franklin. and Franklin County, two volumes, 1909. Vol. I. 9. Walker, C. M. History of Athens County, Ohio.